In ISP-PAZ Forum, Electoral Candidates Bare Peace Platforms » Zamboanga-Basilan Integrated Development Alliance, Inc. THE Candidate’s Forum sought to make public the peace-building agenda of Zamboanga City’s congressional and mayoral wannabes running for seats in the May 13 elections. The forum was a joint effort of the Interreligious Solidarity for Peace together, Peace Advocates Zamboanga and Zamboanga-Basilan Integrated Development Alliance, Inc. (ZABIDA). It was held at the Marcian Business Hotel on April 13 afternoon. Fr. Angel Calvo, CMF, PAZ president, in his opening remarks said the forum would pinpoint issues and concerns relevant to the city’s peace, peace and order, peace process, social justice especially for those who are suffering from social marginalization and environmental destruction. 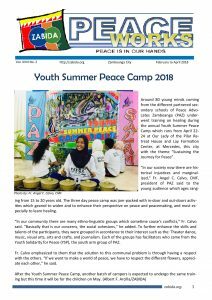 “The election is a significant moment in a life of a country in which the people of the country will have to participate, it is good space that the country needs and to present the real issues that is affecting the lives of the people and it is the issue of peace today in our country that is so important,” Father Calvo said. PAZ vice-president Dr. Grace Rebollos introduced the candidates, who were given seven minutes each to descrive. 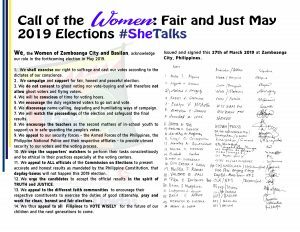 The first to speak was mayoralty candidate Albert Cajayon, who said the people have the right to be educated and that the mayor is just an instrument to educate the people. “I believe that the real transformation is brought about by the people themselves and the government just listens,” he said. Next mayoralty candidate was incumbenyt District 1 Congresswoman Maria Isabelle Climaco-Salazar. She said “today I stand here just like my father carrying his thoughts for this city.” In her years of service to the people of Zamboanga, she said she brought up her achievements especially for the young generation, one example being the “Humanity Towards Oneness In Mindanao”. On the other hand, incumbent District 2 Congressman and mayoralty candidate Erico Basilio Fabian promised to restore peace and order amid the current high incidence of criminality. As for the congressional candidates, first speaker was Chrisler Cabarrubias, who said his peace agenda is for the military to extend medical assistance to civilians and to find solutions in fighting poverty. “If there is poverty there is a no problem of peace and order,” he said. Dr. Cesar Climaco Jr., son of legendary city mayor Cesar Climaco, that “we are not at war, more policemen will not bring peace, and guns do not protect us.” Insead, he is advocating that civilians should be trained to protect themselves and that there should be no corruption and low taxes should be allowed to the people. Congress candidate Monsi Dela Cruz enumerated his social projects in the last 35 years. He has made two colleges and foundation to help those who are poor and pursue his plans in continuing giving free scholarships. Dela Cruz also stated that the current power outages should not stop people from talking about peace. “If we don’t deliver, then vote us out,” he challenged. Incumbent Mayor Celso Lobregat who is running for Congress said that he’s not in the forum to campaign or put anybody down and that he thanked all the people who supported him throughout the years of his service. Lobregat also said that let the people decide who is the most qualified and that he leads from a contract of unity towards a more develop city. Next candidate was Abdurahman Tagayan. “A simple man with an extraordinary mission”, is how he described himself. And, to achieve peace in Zamboanga City we must love, understand, and give way to each other and that we should avoid discrimination between Christians and Muslims, he said. “I am challenging the Armed Forces of the Philippines and the Philippine National Police to make Zamboanga City one of the most peaceful city in the Philippines.” Abdurahman stated. For his oart, congressional candidate Abelardo Climaco, a lawyer for 48 years, said his peace agenda is the amendment of the higher education act. He also he act for the removal of the politicians sitting in the board of the city’s Economic Zone. “It is a business enterprise not a politician enterprise. Former Philippine Air Force officer and candidate for Congress said that he supports the Framework Agreement on the Bangsamoro. Last congressional candidate to speak was Joemar Lobregat, who said Zamboanga City is a city rich in culture and diversity, a model city for mutual acceptance. His peace agenda is to support Peace Education, access to justice, no more room for disagreement, support all socio-economic projects to end all conflicts.